Following a successful bid for Lottery Funding, work on restoring this Grade II listed structure was completed and opened ahead of schedule. The Toll Bridge links Shoreham with Lancing and was originally built across the River Adur tidal estuary in 1781. Prior to 1968 when it became a public bridleway, it was the A27! 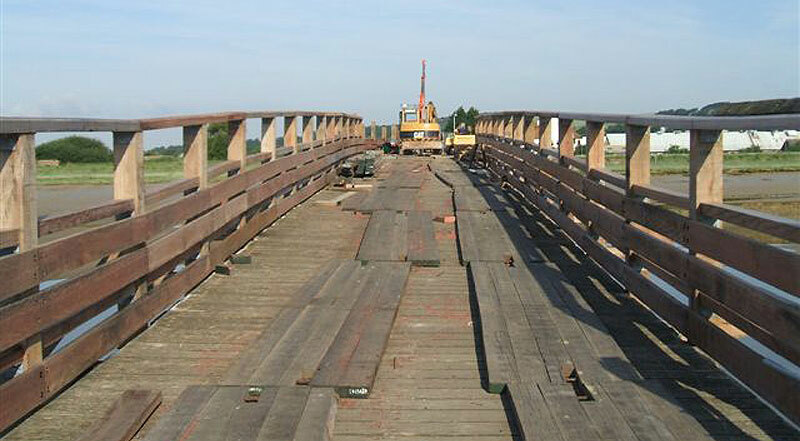 The bridge was closed to the public during restoration and the impact of the work on the public was managed through close consultation with the client. Some of the refurbishment took place under tidal conditions, and the project has a minimum design life of 20 years. • The selective replacement of timber piles, fixings and horizontal and diagonal braces. • Replacement of crossbeams and longitudinal beams supporting the deck. • Use of the existing decking. • New handrail and parapets. • Work on the abutments. The restoration concluded with work on the western abutments. Some old timbers that could not be re-used went to Marlipins Museum, Shoreham and others were recycled by West Sussex County Council and ourselves.